About a month ago, I was able to share this tutorial over at Ucreate. I wanted to share it here with all of you, too! I just love to personalize things–I think it makes everything more fun! This project also has the components that are perfect for little ones…the thickness of the juice can lids is just right for their hands, and the clink when they hit the bottom of the can is sure to please. It’s also easy to do, and can be finished in a day. What a fun gift! 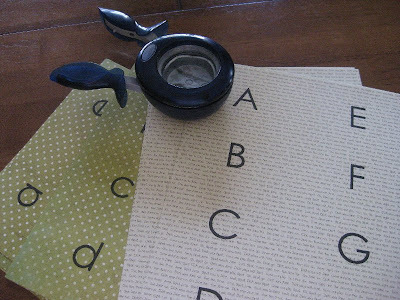 Print the alphabet onto desired scrapbook paper. I did both upper and lowercase, using 2 different papers. The font is Century Gothic, sized to 100. 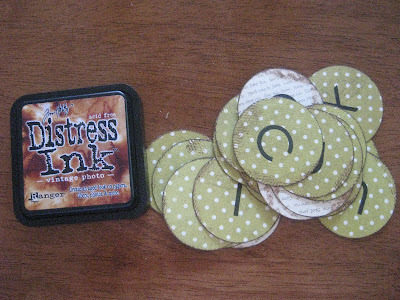 I fit 8 of that size letter on a 8 1/2 x 11 piece of paper (I cut mine down from 12×12, since my printer won’t accept that size), and it was just enough to cut the size of circles I needed. 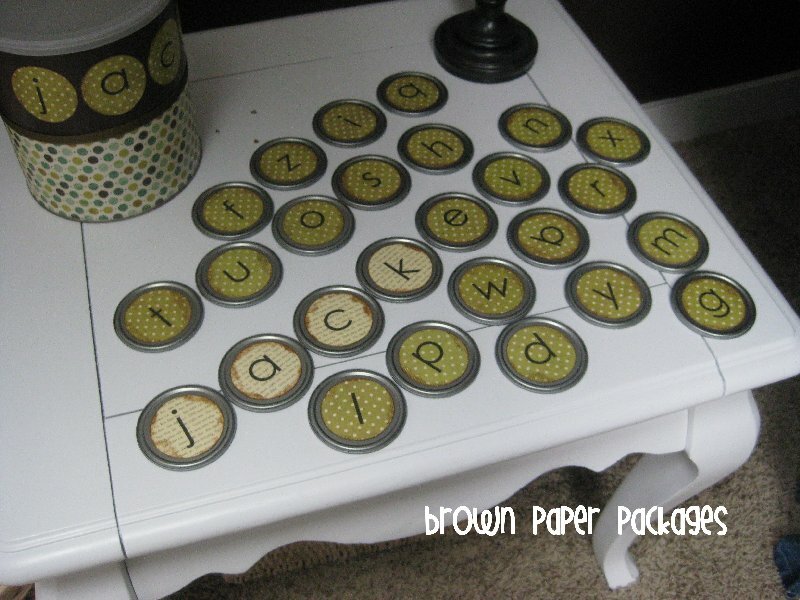 Using your circle punch, center each letter in the middle of your circle and punch it out. I LOVE this punch by Fiskars–it allows you to see exactly what you are punching out, instead of doing it blindly. 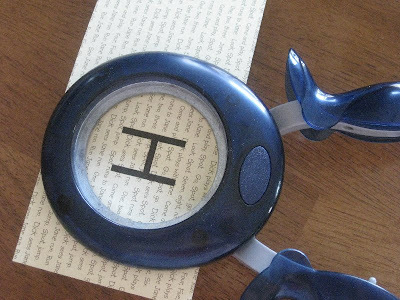 If you don’t have a circle punch, you can always use a glass, trace around the letters, and cut them out. Once they are all cut out, distress them with distress ink. Make sure your juice lids are washed well, then completely dried. Using a foam brush, apply Mod Podge to the bottom of the circle, then center it in the middle of the lid. Mod Podge over the top of the paper as well, and let dry. Once it’s dry, you can repeat the process on the other side with the other set (lower or upper). 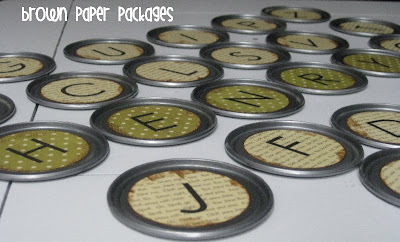 Make sure you match up the letters on each lid–Dd, Ee, etc. 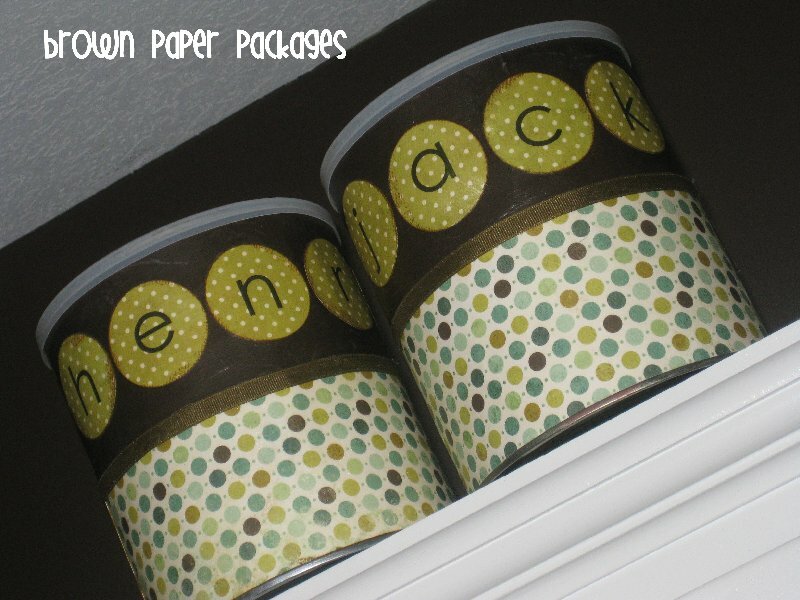 **Because my boys’ names don’t have any repeating letters, I used the contrasting paper for the initials of their name. 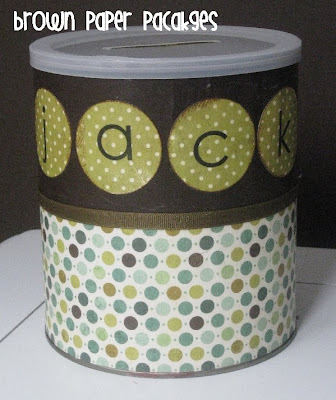 For example, the lowercase letters were done in the green polka dot paper, so for Jack’s name, I used the cream paper for the lowercase j, a, c, and k. I did the same with Henry’s name. While your letters are drying, you can move onto the can. I cut two coordinating papers into strips—3.5 x 12 inches. This wouldn’t quite go around the can, so I cut another piece 3.25 x 7.25 inches to fill the gap. On my can, this made the edges meet up exactly–you will want to measure yours to see if that’s accurate. I then distressed the edges of my paper. 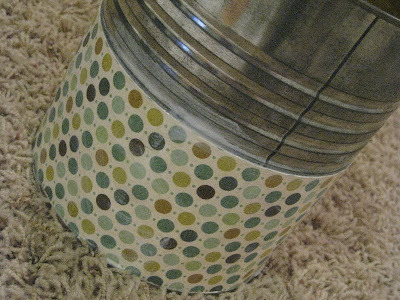 Apply Mod Podge to the bottom of the can, and place your paper on the can, pressing firmly, then add more Mod Podge on top of the paper. Add the second bottom piece, making sure the edges line up. Repeat the process for the top pieces. Let dry completely. After your paper is completely dry, you are ready to add any paper embellishments you like. 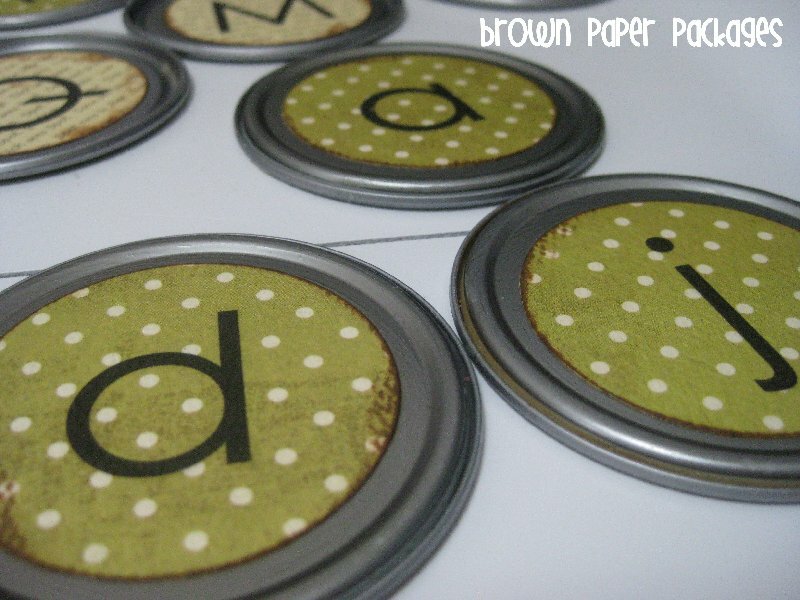 I used the same letter circles to spell the boys’ names–I loved the contrast of the papers. You could use also use vinyl, paint, etc. 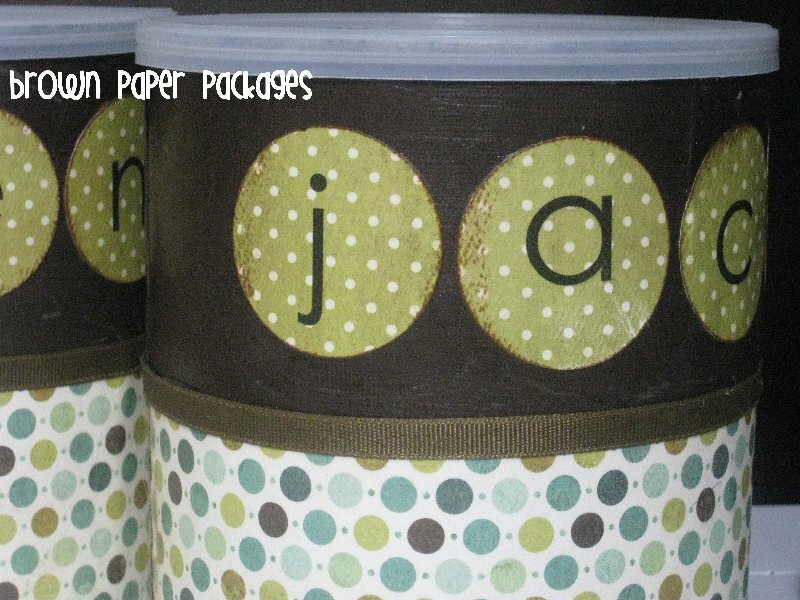 If you use paper like I did, use Mod Podge to secure it in place. Let dry. 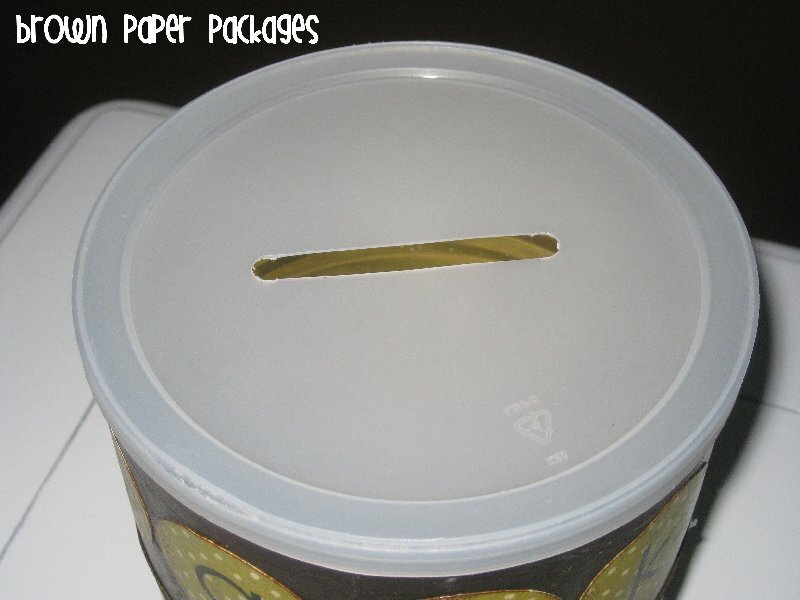 Hot glue your ribbon around the can, where the two papers meet. 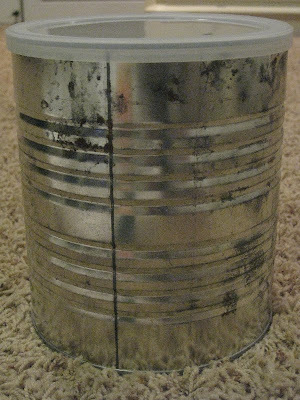 I used a drill for the slit on top of the can. 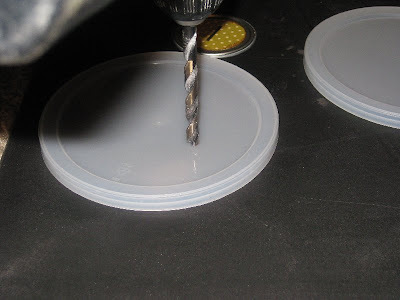 I chose a thick drill bit (a little thicker than the thickness of the lid), and drilled two holes about 2.5 inches long–just a little longer than the width of the lid. Then I took a pencil and drew two lines–connecting the two holes, and forming a rectangle. You can then use an exact-o knife or razor blade to cut it out. You’re done! How darling and fun, plus educational…can’t beat that! What a cute idea! I have a ton of formula cans that I have been saving for crafts! This will have to go on my list! Still love this idea…I just posted about your canvas wreath on my blog. Thank you! This is great, thank you so much for posting the how to! This is adorable! My three year old would get a kick out of it…thanks for the idea! Your blog is fabulous! Have a great weekend! Love your blog! I gave you an award on my blog! This is a darling idea! I think the only thing I would add are small magnets to the backs of the juice lids. Please feel free to link it up tomorrow to Talented Tuesday with My Frugal Family!! And don't forget to enter the giveaways I have posted at the top of my blog! How cute! What a great idea! Thanks for sharing this! I love this. 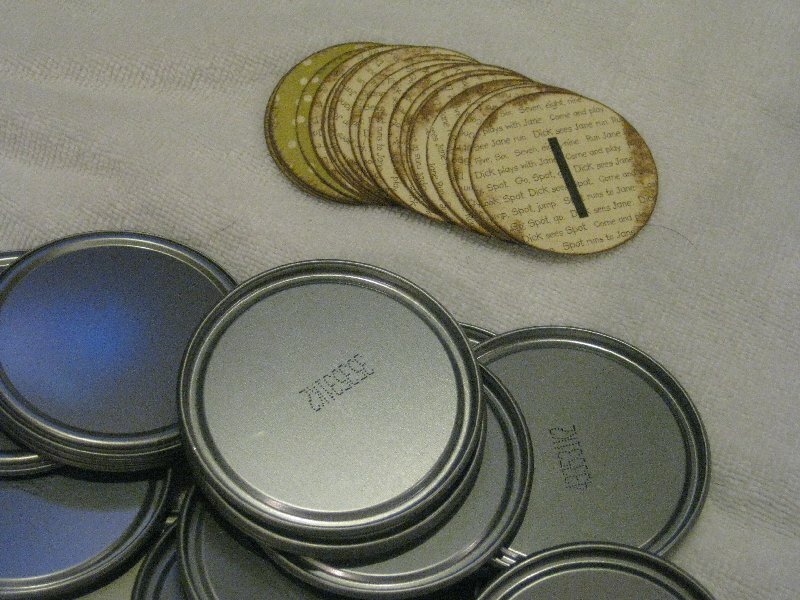 I keep thinking of making magnets out of my juice lids…and now I know what to put on the magnets! 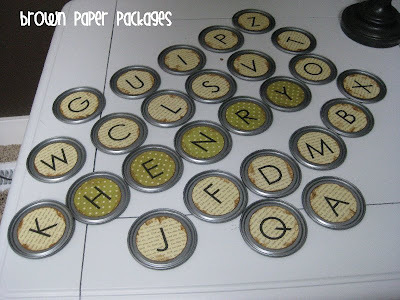 I think pictures for letters would be good, too for a matching game. one lid for a, one lid for apple. Now we need more juice! Remember to use Capital AND lowercase letters for this project as well. When children start out learning letters and are used to seeing both, the learning is more complete and quick. When you begin start with one or two letters . Then add as they become proficient. I just made these as a bday gift for a 2 year old. We are not "juicers" so instead of the can lids, I used 3" round wooden discs (sold at Michael's $3 for 12). It turned out sooo cute and very easy. Now I need to make another set for my daughter!